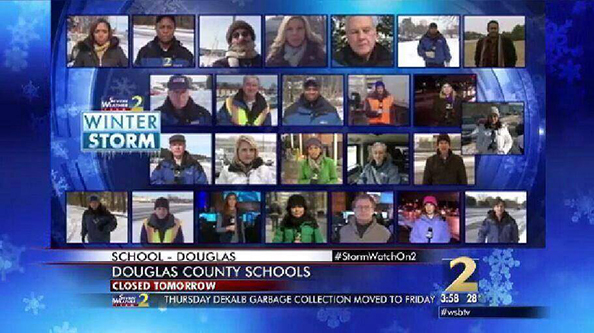 Yesterday Atlanta’s WSB-TV used a 14 box for team coverage of the winter storm the city is experiencing — but the station didn’t stop there. Today the newscast used a 25 box. Yes, that’s right. 25 box. 25 tiny little boxes with barely visible reporter images in them scattered around a tiny “Winter Storm” logo. Of course, this was all to drive home the station’s team coverage of the storm. Call me crazy, but I’m guessing most viewers got the picture with 14 boxes. Just two quick questions here: Does WSB-TV actually have the equipment to do 25 live shots at once (Or were some of them look lives?)? How on earth do you get 25 reporters to smile mindlessly into the camera at the same time?